Back in July, Xiaomi launched the Redmi Pro. It was one of its kind among all other Xiaomi phones because it was company’s very first smartphone with a dual-camera setup. The features that it offered for under $300 was the reason it was going out of stock in China in just minutes. Now, with the new year, Xiaomi is surely looking to introduce the next generation of its previous devices, and we have already seen the Redmi Note 4, a successor to the Redmi Note 3. 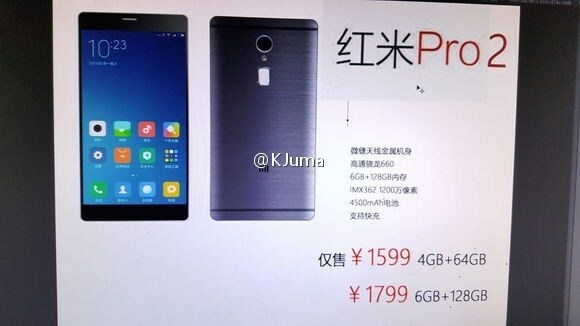 Today, the Xiaomi Redmi Pro 2 has leaked via Weibo through a poster that reveals some of the major specifications of the phone along with the pricing. THIS IS THE XIAOMI REDMI PRO 2! At first glance, we can surely say that the phone has really thin bezels on the sides. It seems that Xiaomi has started a new trend of bezel-less devices with its Mi Mix. Well, the bezels aren’t that thin as compared to those on Mi Mix. Anyways, the screen size seems to be bigger than its predecessor as we can see in the poster. Talking about other specifications, the Xiaomi Redmi Pro 2 is going to feature a Snapdragon 660 processor that is not yet launched by Qualcomm but hopefully, the Redmi Pro 2 is going to be the first phone to feature this chip. There is massive 6GB of RAM and 128GB internal storage, so there is surely no need to worry about storage. We all know how insane the battery life of Xiaomi devices is and so, the Redmi Pro 2 will continue this thing with a massive 4,500mAh battery. We hope to see the fast charging support this time, something that we missed in Redmi Note 4 also. The rear camera is going to be a 12MP Sony IMX362 sensor that is supposed to click some great snaps. Lastly, talking about the pricing, it seems that this device is going to destroy the competition. Well, the price listed on the poster says the same thing, The 4GB RAM+64GB ROM variant is coming for 1599 Yuan or $232 whereas the 6GB RAM+128GB ROM model will be priced at 1799 Yuan or $260. The price to specifications ratio says that this device will be the best smartphone in its price range. We don’t have any information about the launch date yet, but we will surely update you once we get information about it. Stay Tuned.